This chapter begins with a brief recap of some of the key points from the previous chapters, then explores in more detail the important concepts that relate to the Command Query Responsibility Segregation (CQRS) pattern and event sourcing (ES). The CQRS pattern assigns the responsibility for modifying and querying your application data to different sets of objects: a write model and a read model. The immediate benefit of this segregation is to clarify and simplify your code by applying the single-responsibility principle: objects are responsible for either modifying data or querying data. However, the most important benefit of this segregation of responsibility for reading and writing to different sets of classes is that it is an enabler for making further changes to your application that will provide additional benefits. A typical approach to enabling a user to edit data is to use data transfer objects (DTO): the UI retrieves the data to be edited from the application as a DTO, a user edits the DTO in the UI, the UI sends the modified DTO back to the application, and then the application applies those changes to the data in the database. For an example of implementing a DTO, see "Implementing Data Transfer Object in .NET with a DataSet." This approach is data-centric and tends to use standard create, read, update, delete (CRUD) operations throughout. In the user interface (UI), the user performs operations that are essentially CRUD operations on the data in the DTO. This is a simple, well understood approach that works effectively for many applications. However, for some applications it is more useful if the UI sends commands instead of DTOs back to the application to make changes to the data. Commands are behavior-centric instead of data-centric, directly represent operations in the domain, may be more intuitive to users, and can capture the user's intent more effectively than DTOs. 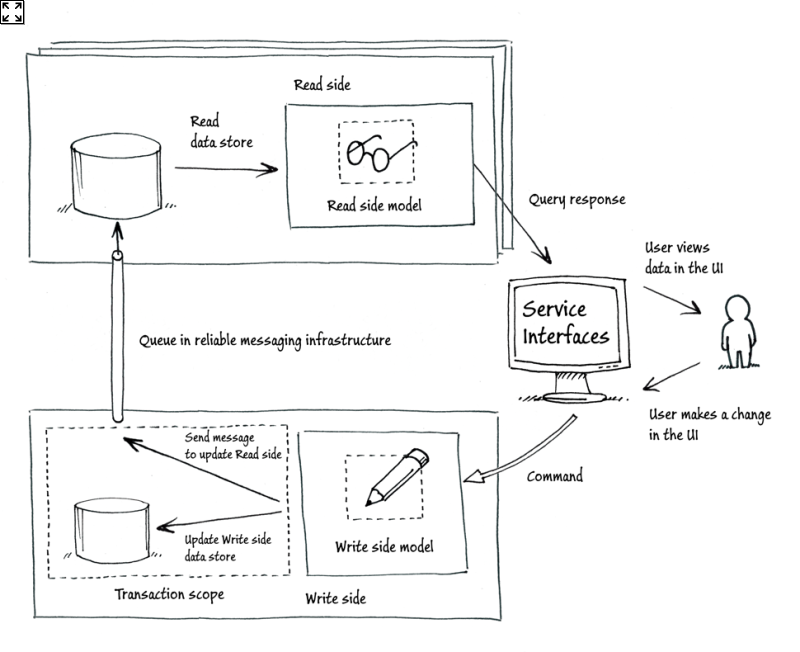 In a typical CQRS implementation, the read model returns data to the UI as a DTO. The UI then sends a command (not a DTO) to the write model. Using commands enables you to build a UI that is more closely aligned with the behaviors associated with your domain. Related to this are the DDD concepts associated with a rich domain model, focusing on aggregates as a way to model consistency boundaries based on domain concepts. One of the advantages of using commands and aggregates instead of DTOs is that it can simplify locking and concurrency management in your application. One of the changes that the CQRS pattern enables in your application is to segregate your data as well as your objects. The write model can use a database that is optimized for writes by being fully normalized. The read model can use a database that is optimized for reads by being denormalized to suit the specific queries that the application must support on the read side. Several benefits flow from this: better performance because each database is optimized for a particular set of operations, better scalability because you can scale out each side independently, and simpler locking schemes. On the write side you no longer need to worry about how your locks impact queries, and on the read side your database can be read-only. If you use relational databases on both the read side and write side you will still be performing CRUD operations on the database tables on the write side and you will need a mechanism to push the changes from your normalized tables on the write side to your denormalized tables on the read side. If you capture changes in your write model as events, you can save all of your changes simply by appending those events to your database or data store on the write side using only Insert operations. You can also use those same events to push your changes to the read side. You can use those events to build projections of the data that contain the data structured to support the queries on the read side. If you use a single database in your application, your locking scheme determines what version of a record is returned by a query. This process can be very complex if a query joins records from multiple tables. Think about the complexities of how transaction isolation levels (read uncommitted, read committed, repeatable reads, serializable) determine the locking behavior in a database and the differences between pessimistic and optimistic concurrency behavior. Additionally, in a web application you have to consider that as soon as data is rendered in the UI it is potentially out of date because some other process or user could have since changed it in the data store. If you segregate your data into a write-side store and a read-side store, you are now making it explicit in your architecture that when you query data, it may be out of date, but that the data on the read side will be eventually consistent with the data on the write side. This helps you to simplify the design of the application and makes it easier to implement collaborative applications where multiple users may be trying to modify the same data simultaneously on the write side. In domain-driven design (DDD), an aggregate defines a consistency boundary. Typically, when you implement the CQRS pattern, the classes in the write model define your aggregates. Aggregates are the recipients of commands, and are units of persistence. After an aggregate instance has processed a command and its state has changed, the system must persist the new state of the instance to storage. An aggregate may consist of multiple related objects; an example is an order and multiple order lines, all of which should be persisted together. However, if you have correctly identified your aggregate boundaries, you should not need to use transactions to persist multiple aggregate instances together. If an aggregate consists of multiple types, you should identify one type as the aggregate root. You should access all of the objects within the aggregate through the aggregate root, and you should only hold references to the aggregate root. Every aggregate instance should have a unique identifier. When you are using an object-relational mapping (ORM) layer such as Entity Framework to manage your persistence, persisting your aggregates requires minimal code in your aggregate classes. The following code sample shows an IAggregateRoot interface and a set of classes that define an Order aggregate. This illustrates an approach to implementing aggregates that can be persisted using an ORM. If you are using event sourcing, then your aggregates must create events to record all of the state changes that result from processing commands. The following code sample shows an IEventSourced interface, an EventSourced abstract class, and a set of classes that define an Order aggregate. This illustrates an approach to implementing aggregates that can be persisted using event sourcing. In this example, the UpdateSeats method creates a new OrderUpdated event instead of updating the state of the aggregate directly. The Update method in the abstract base class is responsible for adding the event to the list of pending events to be appended to the event stream in the store, and for invoking the OnOrderUpdated event handler to update the state of the aggregate. Every event that is handled in this way also updates the version of the aggregate. The constructor in the aggregate class and the LoadFrom method in the abstract base class handle replaying the event stream to reload the state of the aggregate. We tried to avoid polluting the aggregate classes with infrastructure-related code. These aggregate classes should implement the domain model and logic. This section describes the role of commands and command handlers in a CQRS implementation and shows an outline of how they might be implemented in the C# language. Commands are imperatives; they are requests for the system to perform a task or action. Two examples are: "book two places on conference X" or "allocate speaker Y to room Z." Commands are usually processed just once, by a single recipient. Both the sender and the receiver of a command should be in the same bounded context. You should not send a command to another bounded context because you would be instructing that other bounded context, which has separate responsibilities in another consistency boundary, to perform some work for you. However, a process manager may not belong to any particular bounded context in the system, but it still sends commands. Some people also take the view that the UI is not a part of the bounded context, but the UI still sends commands. "I think that in most circumstances (if not all), the command should succeed (and that makes the async story way easier and practical). You can validate against the read model before submitting a command, and this way being almost certain that it will succeed." "When a user issues a command, it'll give the best user experience if it rarely fails. However, from an architectural/implementation point of view, commands will fail once in a while, and the application should be able to handle that." The following code sample shows a command and the ICommand interface that it implements. Notice that a command is a simple data transfer object (DTO) and that every instance of a command has a unique ID. It receives a command instance from the messaging infrastructure. It validates that the command is a valid command. It locates the aggregate instance that is the target of the command. This may involve creating a new aggregate instance or locating an existing instance. It invokes the appropriate method on the aggregate instance, passing in any parameters from the command. It persists the new state of the aggregate to storage. "I don't see the reason to retry the command here. When you see that a command could not always be fulfilled due to race conditions, go talk with your business expert and analyze what happens in this case, how to handle compensation, offer an alternate solution, or deal with overbooking. As far as I can see, the only reason to retry is for technical transient failures such as those that could occur when accessing the state storage." Typically, you will organize your command handlers so that you have a class that contains all of the handlers for a specific aggregate type. You messaging infrastructure should ensure that it delivers just a single copy of a command to single command handler. Commands should be processed once, by a single recipient. The following code sample shows a command handler class that handles commands for Order instances. This handler handles five different commands for the Order aggregate. The RegisterToConference command is an example of a command that creates a new aggregate instance. The ConfirmOrder command is an example of a command that locates an existing aggregate instance. Both examples use the Save method to persist the instance. If this bounded context uses an ORM, then the Find and Save methods in the repository class will locate and persist the aggregate instance in the underlying database. If this bounded context uses event sourcing, then the Find method will replay the aggregate's event stream to recreate the state, and the Save method will append the new events to the aggregate's event stream. If the aggregate generated any events when it processed the command, then these events are published when the repository saves the aggregate instance. A common scenario for commands is that some of the information included in the command is provided by the user of the system through the UI, and some of the information is retrieved from the read model. For example, the UI builds a list of orders by querying the read model, the user selects one of those orders, and modifies the list of attendees associated with that order. The UI then sends the command that contains the list of attendees associated with the order to the write model for processing. However, because of eventual consistency, it is possible that the information that the UI retrieves from the read side is not yet fully consistent with changes that have just been made on the write side (perhaps by another user of the system). This raises the possibility that the command that is sent to update the list of attendees results in an inconsistent change to the write model. For example, someone else could have deleted the order, or already modified the list of attendees. A solution to this problem is to use version numbers in the read model and the commands. Whenever the write model sends details of a change to the read model, it includes the current version number of the aggregate. When the UI queries the read model, it receives the version number and includes it in the command that it sends to the write model. The write model can compare the version number in the command with the current version number of the aggregate and, if they are different, it can raise a concurrency error and reject the change. Events can play two different roles in a CQRS implementation. Event sourcing. As described previously, event sourcing is an approach to persisting the state of aggregate instances by saving the stream of events in order to record changes in the state of the aggregate. Communication and Integration. You can also use events to communicate between aggregates or process managers in the same or in different bounded contexts. Events publish to subscribers information about something that has happened. One event can play both roles: an aggregate may raise an event to record a state change and to notify an aggregate in another bounded context of the change. Developer 1: One of the claims that I often hear for using event sourcing is that it enables you to capture the user's intent, and that this is valuable data. It may not be valuable right now, but if we capture it, it may turn out to have business value at some point in the future. Developer 2: Sure. For example, rather than saving just a customer's latest address, we might want to store a history of the addresses the customer has had in the past. It may also be useful to know why a customer's address was changed; perhaps they moved into a new house or you discovered a mistake with the existing address that you have on file. Developer 1: So in this example, the intent might help you to understand why the customer hadn't responded to offers that you sent, or might indicate that now might be a good time to contact the customer about a particular product. But isn't the information about intent, in the end, just data that you should store. If you do your analysis right, you'd capture the fact that the reason an address changes is an important piece of information to store. Developer 2: By storing events, we can automatically capture all intent. If we miss something during our analysis, but we have the event history, we can make use of that information later. If we capture events, we don't lose any potentially valuable data. Developer 1: But what if the event that you stored was just, "the customer address was changed?" That doesn't tell me why the address was changed. Developer 2: OK. You still need to make sure that you store useful events that capture what is meaningful from the perspective of the business. Developer 1: So what do events and event sourcing give me that I can't get with a well-designed relational database that captures everything I may need? Developer 2: It really simplifies things. The schema is simple. With a relational database you have all the problems of versioning if you need to start storing new or different data. With event sourcing, you just need to define a new event type. Developer 1: So what do events and event sourcing give me that I can't get with a standard database transaction log? Developer 2: Using events as your primary data model makes it very easy and natural to do time-related analysis of data in your system; for example, "what was the balance on the account at a particular point in time?" or, "what would the customer's status be if we'd introduced the reward program six months earlier?" The transactional data is not hidden away and inaccessible on a tape somewhere, it's there in your system. Developer 1: So back to this idea of intent. Is it something special that you can capture using events, or is it just some additional data that you save? Developer 2: I guess in the end, the intent is really there in the commands that originate from the users of the system. The events record the consequences of those commands. If those events record the consequences in business terms then it makes it easier for you to infer the original intent of user. This section examines two alternatives for modeling intent with reference to SOAP and REST-style interfaces to help highlight the differences. We are using SOAP and REST here as an analogy to help explain the differences between the approaches. Example 1. The Event log or SOAP-style approach. Example 2. The Transaction log or REST-style approach. The first approach uses an action-based contract that couples the events to a particular aggregate type. The second approach uses a uniform contract that uses a resource field as a hint to associate the event with an aggregate type. How the events are actually stored is a separate issue. This discussion is focusing on how to model your events. Simplicity and a generic approach. Easier to use existing internet infrastructure. Easier to use with dynamic languages and with changing schemas. Variable environment state needs to be stored alongside events in order to have an accurate representation of the circumstances at the time when the command resulting in the event was executed, which means that we need to save everything! Events report that something has happened. An aggregate or process manager publishes one-way, asynchronous messages that are published to multiple recipients. For example: SeatsUpdated, PaymentCompleted, and EmailSent. The following code sample shows a possible implementation of an event that is used to communicate between aggregates or process managers. It implements the IEvent interface. For simplicity, in C# these classes are implemented as DTOs, but they should be treated as being immutable. The following code sample shows a possible implementation of an event that is used in an event sourcing implementation. It extends the VersionedEvent abstract class. The Version property refers to the version of the aggregate. The version is incremented whenever the aggregate receives a new event. It receives an Event instance from the messaging infrastructure. It locates the aggregate or process manager instance that is the target of the event. This may involve creating a new aggregate instance or locating an existing instance. It invokes the appropriate method on the aggregate or process manager instance, passing in any parameters from the event. It persists the new state of the aggregate or process manager to storage. Maintaining the consistency of business data is a key requirement in all enterprise systems. One of the first things that many developers learn in relation to database systems is the atomicity, consistency, isolation, durability (ACID) properties of transactions: transactions must ensure that the stored data is consistent and be atomic, isolated, and durable. Developers also become familiar with complex concepts such as pessimistic and optimistic concurrency, and their performance characteristics in particular scenarios. They may also need to understand the different isolation levels of transactions: serializable, repeatable reads, read committed, and read uncommitted. Consistency (C). A guarantee that all the nodes in the system see the same data at the same time. Availability (A). A guarantee that the system can continue to operate even if a node is unavailable. Partition tolerance (P). A guarantee that the system continues to operate despite the nodes being unable to communicate. Cloud providers have broadened the interpretation of the CAP theorem in the sense that they consider a system to be unavailable if the response time exceeds the latency limit. "In larger distributed-scale systems, network partitions are a given; therefore, consistency and availability cannot be achieved at the same time." —Werner Vogels, CTO, Amazon in Vogels, E. Eventually Consistent, Communications of ACM, 52(1): 40-44, Jan 2009. For more information about the CAP theorem, see CAP theorem on Wikipedia and the article CAP Twelve Years Later: How the "Rules" Have Changed by Eric Brewer on the InfoQ website. The concept of eventual consistency offers a way to make it appear from the outside that we are meeting these three guarantees. In the CAP theorem, the consistency guarantee specifies that all the nodes should see the same data at the same time; instead, with eventual consistency we state that all the nodes will eventually see the same data. It's important that changes are propagated to other nodes in the system at a faster rate than new changes arrive in order to avoid the differences between the nodes continuing to increase. Another way of viewing this is to say that we will accept that, at any given time, some of the data seen by users of the system could be stale. For many business scenarios, this turns out to be perfectly acceptable: a business user will accept that the information they are seeing on a screen may be a few seconds, or even minutes out of date. Depending on the details of the scenario, the business user can refresh the display a bit later on to see what has changed, or simply accept that what they see is always slightly out of date. There are some scenarios where this delay is unacceptable, but they tend to be the exception rather than the rule. "Very often people attempting to introduce eventual consistency into a system run into problems from the business side. A very large part of the reason of this is that they use the word consistent or consistency when talking with domain experts / business stakeholders. Business users hear "consistency" and they tend to think it means that the data will be wrong. That the data will be incoherent and contradictory. This is not actually the case. Instead try using the words stale or old. In discussions when the word stale is used the business people tend to realize that it just means that someone could have changed the data, that they may not have the latest copy of it." —Greg Young, Quick Thoughts on Eventual Consistency. Domain name servers (DNS) use the eventual consistency model to refresh themselves, and that's why DNS propagation delay can occur that results in some, but not all users being able to navigate to a new or updated domain name. The propagation delay is acceptable considering that a coordinated atomic update across all DNS servers globally would not be feasible. Eventually, however, all DNS servers get updated and domain names get resolved properly. To better understand the tradeoffs described by the CAP theorem, check out the special issue of IEEE Computer magazine dedicated to it (Vol.45(no.2), Feb 2012). How does the concept of eventual consistency relate to the CQRS pattern? A typical implementation of the CQRS pattern is a distributed system made up of one node for the write side, and one or more nodes for the read side. Your implementation must provide some mechanism for synchronizing data between these two sides. This is not a complex synchronization task because all of the changes take place on the write side, so the synchronization process only needs to push changes from the write side to the read side. If you decide that the two sides must always be consistent (the case of strong consistency), then you will need to introduce a distributed transaction that spans both sides, as shown in Figure 1. The problems that may result from this approach relate to performance and availability. Firstly, both sides will need to hold locks until both sides are ready to commit; in other words, the transaction can only complete as fast as the slowest participant can. This transaction may include more than two participants. If we are scaling the read side by adding multiple instances, the transaction must span all of those instances. Secondly, if one node fails for any reason or does not complete the transaction, the transaction cannot complete. In terms of the CAP theorem, by guaranteeing consistency, we cannot guarantee the availability of the system. If you decide to relax your consistency constraint and specify that your read side only needs to be eventually consistent with the write side, you can change the scope of your transaction. Figure 2 shows how you can make the read side eventually consistent with the write side by using a reliable messaging transport to propagate the changes. In this example, you can see that there is still a transaction. The scope of this transaction includes saving the changes to the data store on the write side, and placing a copy of the change onto the queue that pushes the change to the read side. This eventual consistency might not be able to guarantee the same order of updates on the read side as on the write side. This solution does not suffer from the potential performance problems that you saw in the original solution if you assume that the messaging infrastructure allows you to quickly add messages to a queue. This solution is also no longer dependent on all of the read-side nodes being constantly available because the queue acts as a buffer for the messages addressed to the read-side nodes. In practice, the messaging infrastructure is likely to use a publish/subscribe topology rather than a queue to enable multiple read-side nodes to receive the messages. This third example (Figure 3) shows a way you can avoid the need for a distributed transaction. This example depends on functionality in the write-side data store: it must be able to send a message in response to every update that the write-side model makes to the data. This approach lends itself particularly well to the scenario in which you combine CQRS with event sourcing. If the event store can send a copy of every event that it saves onto a message queue, then you can make the read side eventually consistent by using this infrastructure feature. Have very fast responses to queries for data. 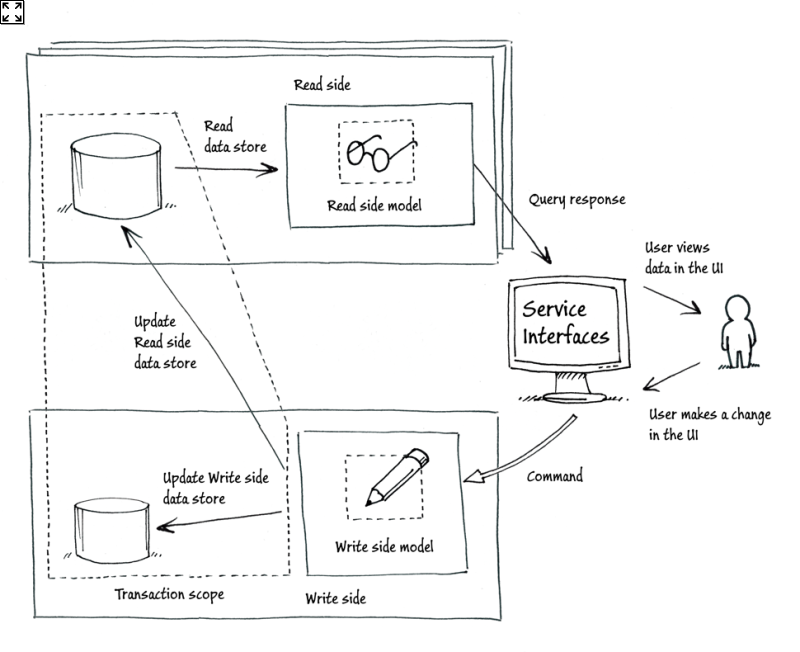 By separating the read side from the write side, the CQRS pattern enables you to design the read side so that the data store is optimized for reading. You can denormalize your relational tables or choose to store the data in some other format that best suits the part of the application that will use the data. Ideally, the recipient of the data should not need to perform any joins or other complex, resource-intensive operations on the data. For a discussion of how to discourage any unnecessary operations on the data, see the section, "Querying the read side" in Chapter 4, "Extending and Enhancing the Orders and Registrations Bounded Contexts" in Exploring CQRS and Event Sourcing. If your system needs to accommodate high volumes of read operations, you can scale out the read side. For example, you could do this in Azure by adding additional role instances. You can also easily scale out your data store on the read side because it is read-only. You should also consider the benefits of caching data on the read side to further speed up response times and reduce processing resource utilization. For a description of how the team designed the reference implementation for scalability, see Chapter 7, "Adding Resilience and Optimizing Performance," in Exploring CQRS and Event Sourcing. In the section "Embracing Eventual Consistency" earlier in this chapter, you saw how when you implement the CQRS pattern that you must accept some latency between an update on the write side and that change becoming visible on the read side. However, you will want to keep that delay to a minimum. You can minimize the delay by ensuring that the infrastructure that transports update information to the read side has enough resources, and by ensuring that the updates to your read models happen efficiently. You should also consider the comparative storage costs for different storage models on the read side such as Azure SQL Database, Azure table storage, and Azure blob storage. This may involve a trade-off between performance and costs. A key goal in optimizing the write side is to maximize the throughput of commands and events. Typically, the write side performs work when it receives commands from the UI or receives integration events from other bounded contexts. You need to ensure that your messaging infrastructure delivers command and event messages with minimal delay, that the processing in the domain model is efficient, and that interactions with the data store are fast. Delivering commands in-line without using the messaging infrastructure. If you can host the domain model in the same process as the command sender, you can avoid using the messaging infrastructure. You need to consider the impact this may have on the resilience of your system to failures in this process. Handling some commands in parallel. You need to consider whether this will affect the way your system manages concurrency. If you are using event sourcing, you may be able to reduce the time it takes to load the state of an aggregate by using snapshots. Instead of replaying the complete event stream when you load an aggregate, you load the most recent snapshot of its state and then only play back the events that occurred after the snapshot was taken. You will need to introduce a mechanism that creates snapshots for aggregates on a regular basis. However, given the simplicity of a typical event store schema, loading the state of an aggregate is typically very fast. Using snapshots typically only provides a performance benefit when an aggregate has a very large number of events. Instead of snapshots, you may be able to optimize the access to an aggregate with a large number of events by caching it in memory. You only need to load the full event stream when it is accessed for the first time after a system start. A simple implementation of aggregates and command handlers will load an aggregate instance into memory for each command that the aggregate must process. For aggregates that must process a large number of commands, you may decide to cache the aggregate instance in memory to avoid the need to reload it for every command. If your system only has a single instance of an aggregate loaded into memory, that aggregate may need to process commands that are sent from multiple clients. By arranging for the system to deliver commands to the aggregate instance through a queue, you can ensure that the aggregate processes the commands sequentially. Also, there is no requirement to make the aggregate thread-safe, because it will only process a single command at a time. In scenarios with an even higher throughput of commands, you may need to have multiple instances of the aggregate loaded into memory, possibly in different processes. To handle the concurrency issues here, you can use event sourcing and versioning. Each aggregate instance must have a version number that is updated whenever the instance persists an event. Optimistic: Append the event to the event-stream if the latest event in the event-stream is the same version as the current, in-memory, instance. Pessimistic: Load all the events from the event stream that have a version number greater than the version of the current, in-memory, instance. "These are technical performance optimizations that can be implemented on case-by-case bases." CQRS and event sourcing use two types of messages: commands and events. Typically, systems that implement the CQRS pattern are large-scale, distributed systems and therefore you need a reliable, distributed messaging infrastructure to transport the messages between your senders/publishers and receivers/subscribers. For commands that have a single recipient you will typically use a queue topology. For events, that may have multiple recipients you will typically use a pub/sub topology. The reference implementation that accompanies this guide uses the Azure Service Bus for messaging. Chapter 7, "Technologies Used in the Reference Implementation" provides additional information about the Azure Service Bus. Azure Service Bus brokered messaging offers a distributed messaging infrastructure in the cloud that supports both queue and pub/sub topologies. Whenever you use messaging, there are a number of issues to consider. This section describes some of the most significant issues when you are working with commands and events in a CQRS implementation. An error in the messaging infrastructure or in the message receiving code may cause a message to be delivered multiple times to its recipient. There are two potential approaches to handling this scenario. Design your messages to be idempotent so that duplicate messages have no impact on the consistency of your data. Implement duplicate message detection. Some messaging infrastructures provide a configurable duplicate detection strategy that you can use instead of implementing it yourself. Some messaging infrastructures offer a guarantee of at least once delivery. This implies that you should explicitly handle the duplicate message delivery scenario in your application code. For a detailed discussion of idempotency in reliable systems, see the article "Idempotence Is Not a Medical Condition" by Pat Helland. An error in the messaging infrastructure may cause a message not to be delivered to its recipient. Many messaging infrastructures offer guarantees that messages are not lost and are delivered at least once to their recipient. Alternative strategies that you could implement to detect when messages have been lost include a handshake process to acknowledge receipt of a message to the sender, or assigning sequence numbers to messages so that the recipient can determine if it has not received a message. The messaging infrastructure may deliver messages to a recipient in an order different than the order in which the sender sent the messages. In some scenarios, the order that messages are received in is not significant. If message ordering is important, some messaging infrastructures can guarantee ordering. Otherwise, you can detect out-of-order messages by assigning sequence numbers to messages as they are sent. You could also implement a process manager process in the receiver that can hold out-of-order messages until it can reassemble messages into the correct order. If messages need to be ordered within a group, you may be able to send the related messages as a single batch. A client may retrieve a message from a queue and then fail while it is processing the message. When the client restarts, the message has been lost. Some messaging infrastructures allow you to include the read of the message from the infrastructure as part of a distributed transaction that you can roll back if the message processing fails. Another approach offered by some messaging infrastructures, is to make reading a message a two-phase operation. First you lock and read the message, then when you have finished processing the message you mark it as complete and it is removed from the queue or topic. If the message does not get marked as complete, the lock on the message times out and it becomes available to read again. If a message still cannot be processed after a number of retries, it is typically sent to a dead-letter queue for further investigation. Some events may become redundant in that they are no longer raised by any class in your system. You may need to define new events that relate to new features or functionality within in your system. You may need to modify existing event definitions. The following sections discuss each of these scenarios in turn. If your system no longer uses a particular event type, you may be able to simply remove it from the system. However, if you are using event sourcing, your event store may hold many instances of this event, and these instances may be used to rebuild the state of your aggregates. Typically, you treat the events in your event store as immutable. In this case, your aggregates must continue to be able to handle these old events when they are replayed from the event store even though the system will no longer raise new instances of this event type. If you introduce new event types into your system, this should have no impact on existing behavior. Typically, it is only new features or functionality that use the new event types. Handling changes to event type definitions requires more complex changes to your system. For example, your event store may hold many instances of an old version of an event type while the system raises events that are a later version, or different bounded contexts may raise different versions of the same event. Your system must be capable of handling multiple versions of the same event. An event gains a new property in the latest version. An event loses a property in the latest version. A property changes its type or supports a different range of values. If the semantic meaning of an event changes, then you should treat that as new event type, and not as a new version of an existing event. Where you have multiple versions of an event type, you have two basic choices of how to handle the multiple versions: you can either continue to support multiple versions of the event in your domain classes, or use a mechanism to convert old versions of events to the latest version whenever they are encountered by the system. The first option may be the quickest and simplest approach to adopt because it typically doesn't require any changes to your infrastructure. However, this approach will eventually pollute your domain classes as they end up supporting more and more versions of your events, but if you don't anticipate many changes to your event definitions this may be acceptable. The second approach is a cleaner solution: your domain classes only need to support the latest version of each event type. However you do need to make changes to your infrastructure to translate the old event types to the latest type. The issue here is to decide whereabouts in your infrastructure to perform this translation. One option is to add filtering functionality into your messaging infrastructure so that events are translated as they are delivered to their recipients; you could also add the translation functionality into your event handler classes. If you are using event sourcing, you must also ensure that old versions of events are translated as they are read from the event store when you are rehydrating your aggregates. Whatever solution you adopt, it must perform the same translation wherever the old version of the event originates from—another bounded context, an event store, or even from the same bounded context if you are in the middle of a system upgrade. 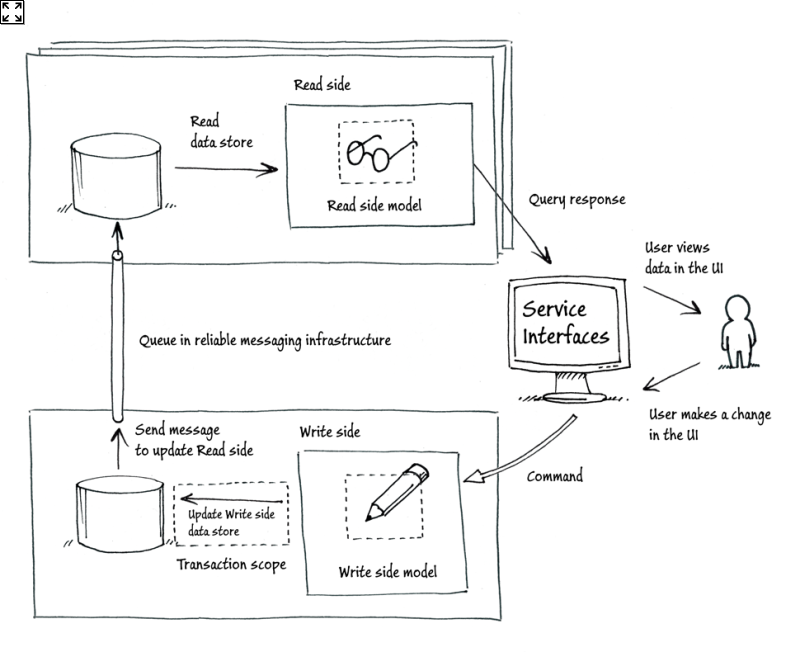 In Figure 3 above, you can see that in a typical implementation of the CQRS pattern, the UI queries the read side and receives a DTO, and sends commands to the write side. This section describes some of the impact this has on the design of your UI. It uses CRUD operations throughout. If you have a domain model you must translate the CRUD operations from the UI into something that the domain understands. It can lead to complexity in the UI if you want to provide a more natural and intuitive UI that uses domain concepts instead of CRUD concepts. It does not necessarily capture the user's intent. It does not use CRUD-style operations. The domain can act directly in response to the commands from the UI. You can design the UI to construct the commands directly, making it easier to build a natural and intuitive UI that uses concepts from the domain. It is easier to capture the user's intent in a command. It is more complex and assumes that you have a domain model in the write side. The behavior is typically in one place: the write model. A task-based UI is a natural, intuitive UI based on domain concepts that the users of the system already understand. It does not impose the CRUD operations on the UI or the user. If you implement the CQRS pattern, your task-based UI can create commands to send to the domain model on the write side. The commands should map very closely onto the mental model that your users have of the domain, and should not require any translation before the domain model receives and processes them. "Every human-computer interaction (HCI) professional I have worked with has been in favor of task-based UIs. Every user that I have met that has used both styles of UI, task based and grid based, has reported that they were more productive when using the task-based UI for interactive work. Data entry is not interactive work." —Udi Dahan - Tasks, Messages, & Transactions. In many applications, especially where the domain is relatively simple, the costs of implementing the CQRS pattern and adding a task-based UI will outweigh any benefits. Task-based UIs are particularly useful in complex domains. There is no requirement to use a task-based UI when you implement the CQRS pattern. In some scenarios a simple CRUD-style UI is all that's needed. "The concept of a task-based UI is more often than not assumed to be part of CQRS; it is not; it is there so the domain can have verbs, but also capturing the intent of the user is important in general." —Greg Young - CQRS, Task Based UIs, Event Sourcing agh! In Chapter 2, "Introducing the Command Query Responsibility Segregation Pattern," we suggested that the motivations for hosting an application in the cloud were similar to the motivations for implementing the CQRS pattern: scalability, elasticity, and agility. This section describes in more detail how a CQRS implementation might use some of specific features of the Azure platform to provide some of the infrastructure that you typically need when you implement the CQRS pattern. When you deploy an application to Azure, you deploy the application to roles in your Azure environment; an Azure application typically consists of multiple roles. Each role has different code and performs a different function within the application. In CQRS terms, you might have one role for the implementation of the write-side model, one role for the implementation of the read-side model, and another role for the UI elements of the application. After you deploy the roles that make up your application to Azure, you can specify (and change dynamically) the number of running instances of each role. By adjusting the number of running instances of each role, you can elastically scale your application in response to changes in levels of activity. One of the motivations for using the CQRS pattern is the ability to scale the read side and the write side independently given their typically different usage patterns. For information about how to automatically scale roles in Azure, see "The Autoscaling Application Block" on MSDN. Persist events to a reliable storage medium. Enable an individual aggregate to retrieve its stream of events in the order in which they were originally persisted. Guarantee to publish each event at least once to a message infrastructure. Azure tables have two fields that together define the uniqueness of a record: the partition key and the row key. This implementation uses the value of the aggregate's unique identifier as the partition key, and the event version number as the row key. Partition keys enable you to retrieve all of the records with the same partition key very quickly, and use transactions across rows that share the same partition key. For more information about Azure table storage see "Data Storage Offerings in Microsoft Azure." The following code sample shows how the implementation persists an event to Azure table storage. An attempt to save a duplicate event (same aggregate ID and same event version) results in a concurrency exception. The Transient Fault Handling Application Block provides extensible retry functionality over and above that included in the Microsoft.WindowsAzure.StorageClient namespace. The block also includes retry policies for Azure SQL Database, and Azure Service Bus. The following code sample shows how to retrieve the list of events associated with an aggregate. The events are returned in the correct order because the version number is used as the row key. To guarantee that every event is published as well as persisted, you can use the transactional behavior of Azure table partitions. When you save an event, you also add a copy of the event to a virtual queue on the same partition as part of a transaction. The following code sample shows a complete version of the save method that saves two copies of the event. // Add a duplicate of this event to the Unpublished "queue"
You can use a task to process the unpublished events: read the unpublished event from the virtual queue, publish the event on the messaging infrastructure, and delete the copy of the event from the unpublished queue. The following code sample shows a possible implementation of this behavior. Potentially it could fail between publishing a message and deleting it from the unpublished queue. You could use duplicate message detection in your messaging infrastructure when the message is resent after a restart. After a restart, you need code to scan all your partitions for unpublished events. The Azure Service Bus offers a robust, cloud-based messaging infrastructure that you can use to transport your command and event messages when you implement the CQRS pattern. Its brokered messaging feature enables you to use either a point-to-point topology using queues, or a publish/subscribe topology using topics. You can design your application to use the Azure Service Bus to guarantee at-least-once delivery of messages, and guarantee message ordering by using message sessions. The sample application described in Exploring CQRS and Event Sourcing uses the Azure Service Bus for delivering both commands and events. The following chapters in Exploring CQRS and Event Sourcing contain further information. Chapter 3, "Orders and Registrations Bounded Context"
Chapter 6, "Versioning Our System"
Chapter 7, "Adding Resilience and Optimizing Performance"
You can find references to additional resources in Chapter 7 "Technologies Used in the Reference Implementation." "Oftentimes when writing software that will be cloud deployed you need to take on a whole slew of non-functional requirements that you don't really have..."
For example, a process manager (described in Chapter 6, "A Saga on Sagas") may process a maximum of two messages per second during its busiest periods. Because a process manager must maintain consistency when it persists its state and sends messages, it requires transactional behavior. In Azure, adding this kind of transactional behavior is nontrivial, and you may find yourself writing code to support this behavior: using at-least-once messaging and ensuring that all of the message recipients are idempotent. This is likely to be more complex to implement than a simple distributed transaction.